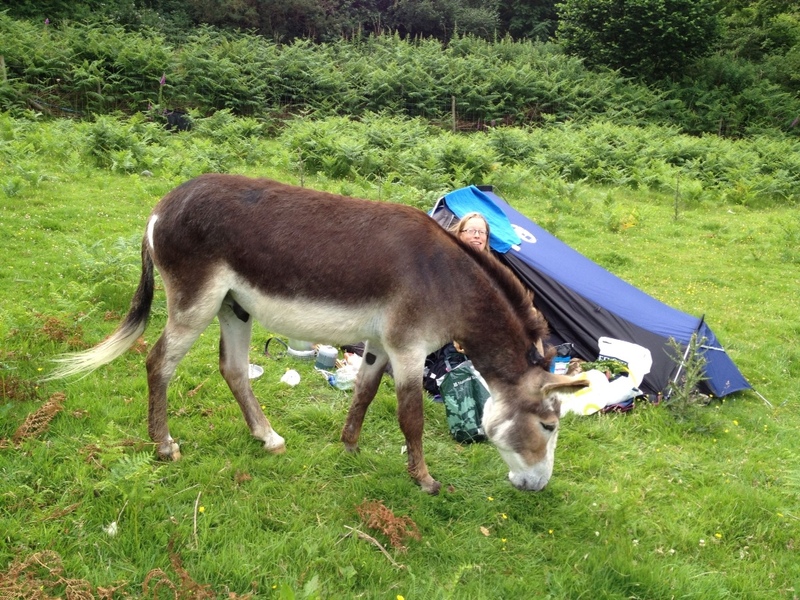 It astonishes me every evening how little a donkey needs compared to a human being. Even with my needs pared down to the carryable minimum, making him happy for the night takes a fraction of the things and time that making me happy takes. He sorts himself out with a bath first – a dust roll that takes less than a minute. Then dinner – two handfuls of an alfalfa and molasses mix, and some horse nuts, for added calories, protein, vitamins and minerals. Wash it down with a little salt lick, some water and some of whatever trees or grass the field has to offer, then retreat a comfortable distance, eyelids to half-mast, and snooze. In comparison I have heaps of bits of brilliantly engineered, light, tough bits of kit. There’s nothing like a change in the weather to make me appreciate them. First off: my little house. 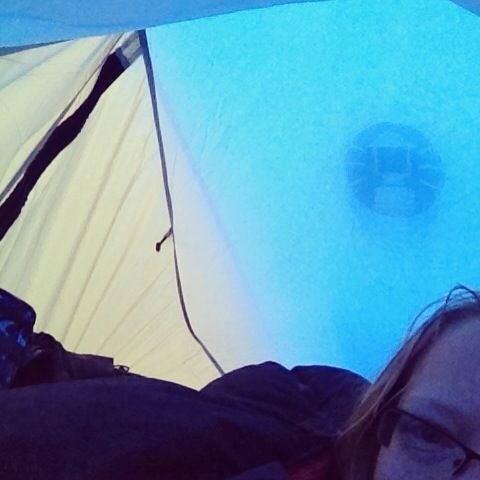 After sleeping in this tent for the majority of the last three-and-a-half months, I am very attached to it. It weighs 2kg – not the lightest on the market. You can get tents that do all they can to weigh under one kilo, but I chose this one because it looked like it would last the distance, and there’s space in it for two people. I can just sit upright in it, which makes a huge difference when the weather’s bad. There’s a clever compartment though the other side of the inner which isn’t accessible from the outside, and the pack saddle and pad, donkey food, saddlebags and shoes all stash in there, out of the way and hidden from view. 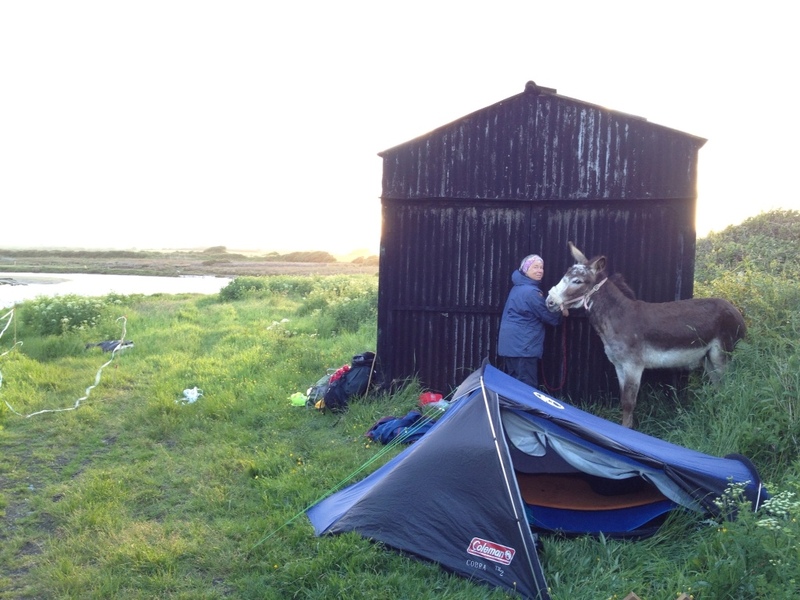 The inner tent is long enough that I can have my backpack in there at the head end and still stretch out; the groundsheet is strong enough to have withstood corn stalks in Newport, brambles in Swansea and a thistle field in Conway. The outer is unscathed, and is a good wedge-shape to see off the wind, not to mention the hail in Pwllheli, in June. The whole thing is really easy to put up – lucky as I have had to do it in the dark many times, and can foresee that becoming even more par for the course now that it’s dark at 8pm. And best of all the whole thing bundles into a drawstring bag – gone are the days of having to clamp a wet tent between my thighs while dragging a reluctant zip inch by inch along a straining bag. It’s bright blue, which I decided would be fine even for wild camping. There are two ways of going about wild camping – either the covert, everything-in-shades-of-khaki, you-can’t-see-me, gone-at-dawn sort of wild camping, or the yes-it’s-a-tent, we’ll-be-off-after-lunch, isn’t-your-dog-well-behaved? sort of camping. With a donkey in a corral alongside, the second type seemed more open to me, so blue is fine. Downsides? The inner has suffered a little with two tears in the seams. One I’ve sewn up using all of the rainbow threads in my mini sewing kit. The other I’ve not got round to yet, and it seems less important now the bitey things that bite are subsiding. Also, the pockets on the inside droop when you put anything much in them – they could do with being a few inches deeper, I think. It means that whatever’s in there sags onto my face when I’m asleep – bearable if it’s anything that belongs to me, and wildly infuriating if it’s anything that belongs to Rhys. 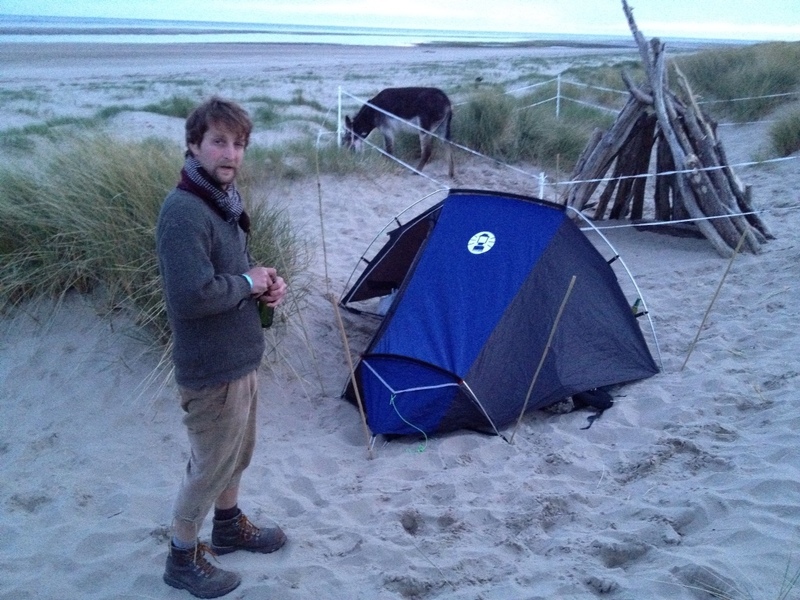 I have a super-high-spec, over-£300, well-under-1kg ‘guest’ tent which I used when I was walking without Chico on Anglesey, and it is gorgeous, but in reality too small for two to live in for a whole summer, with smelly, hairy tack too. I also really like that the Coleman is so reasonably priced – adventuring and living outside really needn’t be only for gear-nerds with lots of disposable income. It’s a Coleman Cobra, RRP £100 but available for £60-£80 with a little shopping around. Nice work, Coleman! Oh, blue was definitely the best choice! It looks so bright and cheerful in there – saggy bits notwithstanding. That deep blue definitely suits you both.. a thoughtful colour! Is that Jo by the tin shed? And forgive me for asking, but exactly are you now? Luckily the weather is still good and mild, but as winter rumbles in, how much longer will you and Chico go on through the year? WIll you only stop once you get right round, or will you have a break?